I have a long list of projects I want to complete which happily uses all the same warp; a dark value warp in polyester serger thread. The last time I put on a long warp in sewing thread was way back in 2007. I had a 20 inch wide warp of sewing thread hung in a trapeze like structure in our dining room which worked out quite nicely. But I have never warped the same way twice and the trapeze deal seemed like an overkill for the width I am putting on. Ah, so what to do? It is important to keep this thread under tension and the twist going in the correct direction or the threads just twist around themselves and it takes quite a bit of patience and time to wind them onto the beam. I had just put on a short warp on a few days ago where the twist was especially lively. I didn't want a repeat of that experience. 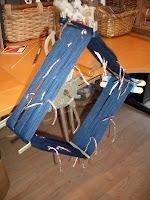 I was intrigued by a comment that Peg made about someone using a niddy noddy for keeping the warp at an even tension. I don't have a niddy noddy but I do have some type of metal contraption I bought at a Guild sale for five bucks. I thought I'd try it. Here is the result. 1.4 miles of thread all ready to be rolled onto my loom. Sure doesn't look like that much. I will report back on how easily it rolled on...or not. Hi Nicki, I'm glad my post came at an opportune time for you!